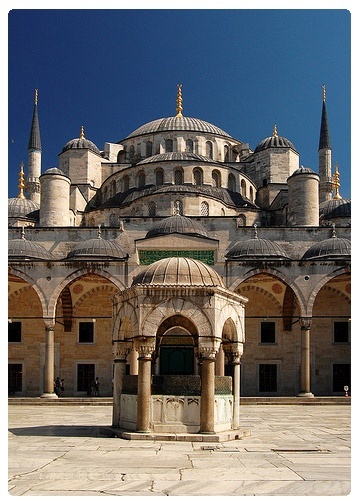 The Blue Mosque or Sultan Ahmed Mosque in Istanbul is the work of Sedefkar Mehmet Aga , a pupil of the architect Sinan . It is situated opposite the Hagia Sophia , separated both by beautiful landscaped, and is the only one in Istanbul that has six minarets . Not the grand exterior overshadows its sumptuous interior, in which a true symphony of beautiful blue tiles Iznik , give this space a very special atmosphere.